“Mars has become a kind of mythic arena onto which we have projected our Earthly hopes and fears.” – Carl Sagan, Cosmos. (1980: New York, USA: Random House.) p. 106. Images of Mars and Martians have also provided much grist for the mills of popular culture. When I interviewed the scientists we feature in Searching for Life on Mars, I asked them about their favorite appearances of Mars in popular culture. Their answers–Edgar Rice Burroughs’ pulp swashbuckler from 1917, A Princess of Mars, and the 1960’s American sit-com, My Favorite Martian–represent the antipodes of the ways in which the modern imagination has regarded Mars. In 1917, Edgar Rice Burroughs (best-remembered as the man who brought us Tarzan) published the first in what came to be a series of novels about the adventures of John Carter, a civil war veteran mysteriously transported to Mars in the midst of an Indian attack. Mars, called “Barsoon” by its inhabitants, is strictly divided along racial lines. Princess Dejah Toris belongs to the humanoid and civilized Red Martians, who are beset upon by the barbaric Green Martians, twelve feet tall, with four arms and huge eyes on the sides of their heads. As with Superman on Earth, the lower gravity on Mars endows Jon Carter with extraordinary powers, while his white skin, belonging to a noble race now extinct on Barsoon, gives him mythic status. 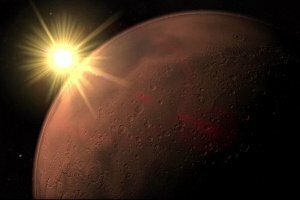 At the same time, some authors imagined a more threatening Mars. War of the Worlds, H.G. Wells’ science fiction novel from 1898, was one of the first to imagine a conflict between humankind and a superior alien race. Orson Welles’ realistic 1938 radio adaptation triggered panic as listeners mistook the broadcast for live coverage of an actual invasion. Successful movie adaptations of War of the Worlds were produced in 1953 and 2005. -The 1962 Topps trading card series Mars Attacks, which depicted an invasion by sadistic and hideous Martians with so much explicit gore and implied sexuality that a public outcry led the company to halt production. By the 1960’s, the sci-fi movie cycle had generated into cheapies such as Santa Claus Conquers the Martians (1964) and Mars Needs Women (1966). In mainstream American culture, extraterrestrials from the Red Planet were sufficiently domesticated for Ray Walston to play Uncle Martin in My Favorite Martian (1963-1966). Martin’s ability to turn invisible when he raised his retractable antennae was played strictly for laughs. Besides nostalgia for the Martians of their youths, the scientists we interviewed, Chris McKay, David Blake, Nathalie Cabrol and Tori Hoehler, all offered speculation about a more serious consequence if life were confirmed on Mars. Christianity earlier embraced the geocentric views of Ptolemy and Aristotle where the Earth was the center of the universe, around which all else revolved, just as mankind was the center of God’s creation. The ideas that the Earth moved around the Sun, or that men evolved from apes were–and in some quarters still are–strenuously resisted as undermining the belief that life was created on Earth as part of a divine plan. If there were another, perhaps earlier creation, a second genesis–as proof of life on Mars would imply–what becomes of our starring role in history? What would be the effect on our pride, could our religions survive? For now, the answers to such questions are the province of the writers of science fiction, but if the scientists find what they’re looking for, that might not remain the case in the near future. Watch Searching for Life on Mars. Rachel Silverman has traveled the globe producing and reporting news and public affairs programs for some of the world's leading television networks. She took two languages in high school in order to dodge the science requirement, and has been working diligently to make up for that shortcoming. Rachel is a five-time national Olympic Weightlifting Champion, and a member of the U.S. Weightlifting Hall of Fame. She lives in the San Francisco Bay Area with her husband and their daughter.